There’s no question that many of the freedoms that we enjoyed as Americans 20 or 30 years ago have gradually eroded. Heightened fear over crime, zero-tolerance policies, tough drug laws, and the war on terrorism have all brought about compromises to the freedoms that we once took for granted. We can get into a deep analysis of exactly how, where, and why it’s happened, but it’s the reality of our time. I think that it’s safe to say that the advance of the Internet has made much of the loss of freedom somehow more tolerable than it would’ve been without it. Despite attempts by governments to restrict freedoms in different directions such as blocking or censoring directions, the Internet has caused a flood of freedom that has not been seen since United States became an independent nation in 1776. Consider the ways that the Internet has enabled us to maintain certain basic freedoms. In the Bill of Rights, the First Amendment grants Americans the freedom to practice any religion, freedom of the press, freedom to speak freely, the right to peaceably assemble and to petition the government. 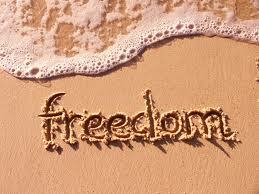 In a world of fear and political correctness, these freedoms are gradually wearing down. People are afraid to discuss or write about certain topics that others might find offensive. In other cases, people are afraid to make public challenges to government policy out of fear of being labeled an enemy of the state – a consideration that did not exist prior to 9/11. The Internet has become the last bastion of true free speech. It is the one place were people can go to exchange ideas in truly open forums. While there is some excess here, people have so far shown themselves to be “solid Internet citizens” expressing their ideas freely, but not doing so in a way that threatens others. It has also become a place where people across the nation and around the world can come and freely discuss ideas and beliefs in religion, politics, social issues and world affairs without fear of censorship. If we lose freedom on the Internet, this most basic freedom granted to us by the First Amendment may be lost forever. In a nation increasingly hogtied by control from one source or another, people often believe activities to be illegal that actually aren’t. As a recent example, a story broke this month in which police in Garden City, NY, threatened – on a complaint by a neighbor – to ticket a man for washing his car in his own driveway, in violation of a local ordinance that prohibits washing a car in a public place. Clearly someone is interpreting a private driveway to be a public place and the police are agreeing – whatever the reason. It sometimes seems as if everything is illegal even if it the illegality defies logic. But according to the Ninth Amendment, rights not specifically granted to the people by the Bill of Rights are presumed to belong to the people. Put another way, unless there is a specific law against it, it’s perfectly legal – what ever it happens to be. This amendment seems to have declining significance, despite the fact it’s actually written into the Bill of Rights. The internet is one of the last venues where we can go and comfortably assume that we aren’t breaking any laws. Up to this point at least, just about the only activities that are illegal are the ones we inherently know to be so. Otherwise, we can go about our business. Though we don’t often think of access to limitless information as being a form of freedom, it actually is. It’s been said – correctly – that the average person today has access to more information than presidents, kings, and the wealthy did 100 years ago, all because of the Internet. That access not only enables us to research just about any topic we choose, it also gives us the ability to make intelligent choices as consumers, research health issues, and even to shop freely. Though we may be shaken down by government agents while going through the airport, the ability to return home and freely access tremendous volumes of information on the web softens the sense of lost freedom in other areas of life. Traditional full-time employment with benefits has been getting harder to find in the past decade or so. Much of that has to do with economic factors, but it also has to do with economic policies that favor large institutions over small businesses, off-shoring of jobs, and the explosion of technology – all of which are rendering human labor less necessary all the time. Employment freedom is clearly on the wane. But much of the weakness in employment is being at least partially remedied by greater economic opportunity brought about by the Internet. The web enables us to trade with people all over the nation and all over the world. It also enables a person working out of his own home to run what appears to be a much larger business. And in point of fact, because of the web a single person can do the job of many, as well as subcontract out any work that he can’t handle on his own. It is probably not an exaggeration to say that the majority of small business opportunities in the world today are found on the Internet. If we let that get away, or allow it to be restricted in a serious way, we might feel the full effects of the decline in full-time employment. The web is giving us the measure of economic freedom that was only known during more prosperous times in our history. At a time of declining freedoms overall, one area where freedom has increased substantially is in our ability to communicate. The Internet gives us a real time, inexpensive way to communicate with other people in our communities, and all around the world. That ability can make us feel free even as other freedoms are gradually slipping away. We can largely ignore the extensive background checks we need to pass in order to get a job, security checks at airports, and the plethora of forms that we need to fill out for our income tax returns, because our freedom to communicate with people all over the world has only increased in recent years. The Internet has become an island of freedom in a world that is steadily becoming less free. If internet freedoms are attacked, we will begin to feel what the loss of freedom truly is. Yet there are people in the world – many of them in high places – who would like nothing better. Some of them are looking to restrict Internet freedom for noble reasons, like protecting the nation from terrorist attacks. Others have less benevolent purposes – they’re primarily concerned with limiting competition to their own operations. Perpetual surveillance. We’re already getting revelations of this, with the Edward Snowden affair, revealing that the NSA has been routinely gathering information on virtually the entire population of the country. The Cold War was largely a struggle against an evil empire that did exactly that to its own citizens, and aspired to do it to the rest of the world. Are we really okay with this happening in America today? Monitoring is the first step toward restricting. Once sales taxes are imposed on Internet sales, the barn door will be open for all kinds of other taxes, fees, and other economic regulations. Taxing Internet transactions would reduce the attractiveness of doing business online, which would not only hurt the economy, but it will also hurt small businesses, and force people to transition from self-employment back to jobs – jobs that don’t necessarily exist anymore. In fact, the Internet has been one of the biggest buffers against rampant unemployment. Outright censorship in certain countries. Many would like to extend political correctness to the Internet. At least part of the reason why people are leaving the print media in favor of the Internet is because of the Internet’s “raw nature” – it’s a place that we can go to, to hear the unfettered opinions of other people, often people are just like us. There is a general sense that the mainstream media is somehow filtered, and the Internet is a place where you can go to find ot what’s really going on. Many other countries in the world are already actively censoring the Internet within their own borders. Recent stories have emerged about China doing this, but they are hardly an exception. We should resist that trend here in the US. In very real and practical ways, the Internet has really become the last bastion of freedom in the world. We should see that as the blessing that it is, and do all we can to make sure that it stays that way. We can do this by actively opposing politicians and business leaders who would restrict or reduce Internet freedoms. We can certainly vote against politicians, but we can also write letters, send emails, and make phone calls when they start suggesting Internet restrictions. There are also large Internet participants who organize formal protests or start petitions to fight internet restrictions. We should keep an eye out for those, and be ready to participate in them where available and necessary. The worst thing we could do is to roll over and die about Internet freedoms, the way we have with so many of the other freedoms that we’ve lost over the years. It used to be said, If the light of freedom goes out in America, it will go out in the world. Today, we might say that equally about the Internet. Are you at all concerned about the potential loss of freedoms on the Internet? The current administration in D.C. absolutely wants to be a dictator. Evidence his state of the union address where he says he’ll enact legislation without congress and contrary to the Constitution. Those in charge want to control every aspect of your life. This attitude is filtering down to state and municipal governments as well. There will continue to be attacks on the freedom of the internet because it is the one arena where the press is not in the back pocket of the government. As long as people can use the internet to communicate we have HOPE that we do not get the CHANGE the current administration wants. OK, I’ll end political rant now. Hi Kathy – I understand what you’re saying about the current administration. But from where I sit, freedom has been under assualt since before 2009 when they came into office. It isn’t a person or a party that threatens us, but rather the desire of politicians everywhere to control, regulate, allocate and tax everything that exists. That’s a mindset, not a political pursuasion. It’s tragic that once people – even well meaning people – get into positions of power, they forget what it is to be a citizen. Every politician should be a citizen FIRST and a politician second. The Bible teaches us about servant leadership, but even Christians forget about this once in office. As the saying goes, power corrupts.